Congratulations to CJ Pinch-Rolla from Evolution Control Committee for taking first place in the 2003 championship. 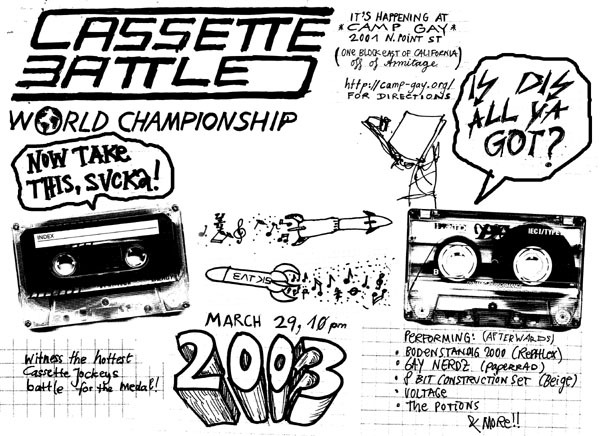 You may email cassette@post-data.org to be notified when video tapes of the 2003 battle are available. The 2002 Championship archive is now available. Radical Software Group - "Trow our arcade fag lips." PaperRad - "Too high, much live." Hefty Records - "Hefty records." Turntable Lab - "Asian hip-hop lockdown." Select Magazine - "Chicago's favorite media-art quarterly." Kaiju Big Battel - "Big Monster Fight Boom."